Use separate ground rods, as sharing can cause signal coupling through the connection. The copper coating on steel ground rods disappears with time. Recommend the use of thick wall copper pipe, available in most hardware stores. Break away ties/fastenings improve wire survival from falling limbs, and trees. 40 to 50 pound monofilament fish line works well. Keep the Beverage ends away from towers that can re-radiate signals, even if they are not used as transmit verticals. Woods, trees, and vegetation, represent only minimal signal loss reported over many years. One wooded area, low to the ground Beverage at my QTH is also under the snow much of the winter, and works fine. Maintain a reasonable constant height above ground except at the ends that may be tapered to ground level. Follow the general contour of the earth, but not every small dip or bump. Beverage antennas "want to work". For best results run a straight line. If a straight run can not be maintained, good results can be obtained with less than perfect. If the Beverage is being used as a single direction terminated antenna, the termination resistance is controlled more by ground conductivity, than wire height. A poor conductivity earth termination would typically be 350 ohms or lower. A more conductive earth termination would typically be 450 ohms or higher. If you are near the sea, running the Beverage antenna along the beach will result in a antenna that will not work well. You could arrange your Beverage so it starts or ends up near the waters edge to get a good ground, and run away from the coast line at 90 degrees, to receive those low angle signals that tend to follow sea water. For other directions avoid the ocean's edge. If sea water extends under the earths surface inland, treat this as a high conductive area. When purchasing a Beverage antenna transformer, recommend a 450 ohm transformer for a more conductive locations, and a 330/350 ohm transformer for a low conductivity locations. Closer matching to the transformer will increase the signal to your radio, but will not change the antenna pattern. Beverage antennas are low impedance, low Q devices, and do not couple well. Beverage runs can cross each other if a few feet of clearance is allowed. For those not wanting to go in to a switchable Beverage system. It is possible to recieve in the direction that wires can not be run. A KB-2 transformer can be connected to two wires running away from the direction wanted will provide that reverse directivity. (One of the two wires grounded at the far end, a ground rod at the KB-2 box, a termination resistor on the forward SO-239 connector, and a coax from the reverse SO-239 KB-2 connector to your radio shack is all that is needed). This method is not new. Harold Beverage used it at 1XAO the Belfast, Maine long wave, radio relay station in 1923. There have problems reported using heat shrink on termination resistors, and multiple reports saying no protective covering is necessary. When using individual wires, maintain the spacing between the two wires. This will help the front to side signal ratio to be near optimum. Treating the wire spacing like a transmission line will help the forward and reverse signal levels to be more equal with proper transformers. Slope the wires down to ground at both ends? I tried this at my locations, and at a friends QTH. We found the slope did not change low angle vertical signals compared to a straight drop. We did find that high angle signals were reduced, with longer than 1/4 wave slopes. The coax outer shield can pick up signals and compromise the front to back. 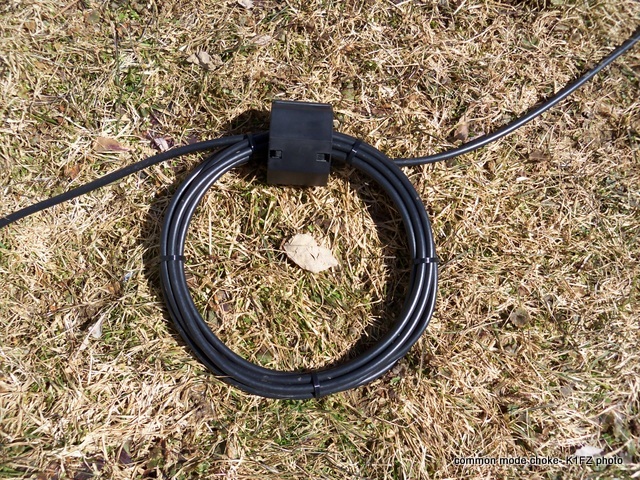 It is good to have the last 60 or more feet of coax buried near the KB-2 box. This avoids pick up and the capacitance to ground will have a beneficial effect. Coax laying on the ground is usually OK. In cases where the coax is above ground, an effort should be taken to remove common mode signal pick up. Standard published wire lengths for a Beverage from "on line" tables available are 290, 440, 600, 800 feet. Covered wire results in a slowing of radio waves known as velocity factor. A given covered wire length will resonate lower in frequency than uncovered wire. Much of the expense of a two wire Beverage is the cost of the wire, and upkeep. 450 ohm cable expense is high, and breakage repair is difficult. WD-1 wire is inexpensive, but repair is somewhat difficult. (Steel strands send me looking for band aids) Both types can deteriorate if water penetrates the insulation. Galvanized electric fence wire spaced about 4-6 inches has an impedance about 600 ohms (depending upon wire size), and is available for about $22.00 for 1/4 mile at farm supply stores. A Western Union splice works well in case of breakage. In the past, tried a 680 ohm two wire Beverage antennas using electric fence wire spaced horizontally, then vertically. No reception difference noted. I found vertical runs much easier with out the need of cross arms. Increased common mode decoupling of the coax cable was often accomplished by addng a coil of many coax turns, combined with added ground rods.. As time passed the number of turns were reduced by adding ferrite cores. Now a popular choke is constructed by winding 6-8 turns of small diameter coax in a 6 inch diameter coil and held together with plastic ties. One mix 31 ferrite 'clamp on' core Amidon 2x31-1081P2, or equivalent is installed over the windings. Propagation note: On 160, look for the auroras. Early after they strike the energy goes to the Earth's poles. At that time, depending upon location, they can give great extended DX, and spotlight propagation. Worked in the late 1950's to early 1970's for WLBZ-TV Bangor, Maine as a transmitter engineer. Presently semi retired and working as the Contract Engineer for WERU-FM 89.9 MHZ, listen on line at www.weru.org , a PBS Community Radio FM broadcast station. Music, programs vary with day, and time of day. My favorite is Jazz music 6-8PM weekdays eastern time zone.